← Celebrate Latinx Heritage with Latinx Unidos! UPS has had an official student newspaper for almost as long as the university has existed. Published under three different names – Ye Recorde (1895-1903), The Maroon (1903-1911), and The Trail (1911-present) – the official student newspaper has published over 2,000 issues over the past 123 years. However, unbeknownst to many, during that time at least six other alternative newspapers sought to compete with the official newspaper. 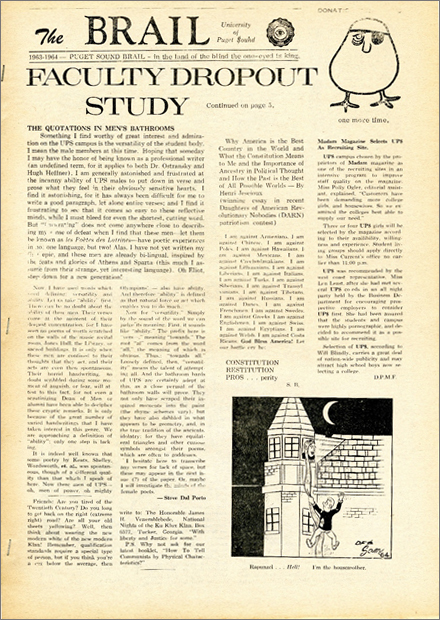 These underground papers were mainly published during the 1960s and 1970s, a time of social and cultural upheaval across the United States, and frequently criticized The Trail for failing to provide a forum for criticism of the university. The Brail was one such alternative newspaper. Published between 1963 and 1965, The Brail offered “a criticism, not only of the TRAIL, but of student government in general” (1964 Tamanawas, pg. 152). At a time when the campus climate leaned more conservative, The Brail was noticeably liberal and somewhat anti-establishment; it “[existed] in spite of lethargy, apathy, and dynamic inertia” on campus (April 1964). The paper’s motto was “In the land of the blind, the one-eyed is king”, which is an Erasmus quote. The name of the paper is a reference to this quote, as well as a play on The Trail. The Brail frequently used satire and humor to make its point. For example, UPS and Puget Sound are always stylized as UP$ and Puget $ound, and the 1963-1964 issue references the university’s motto at the time, saying “UP$–Dedicated to learning, good government, and the Christian religion. Well, two out of three isn’t half bad.” The paper’s editor, Dennis Flannigan, was ultimately asked to leave campus by President R. Franklin Thompson after receiving a warning regarding continuing to publish The Brail. 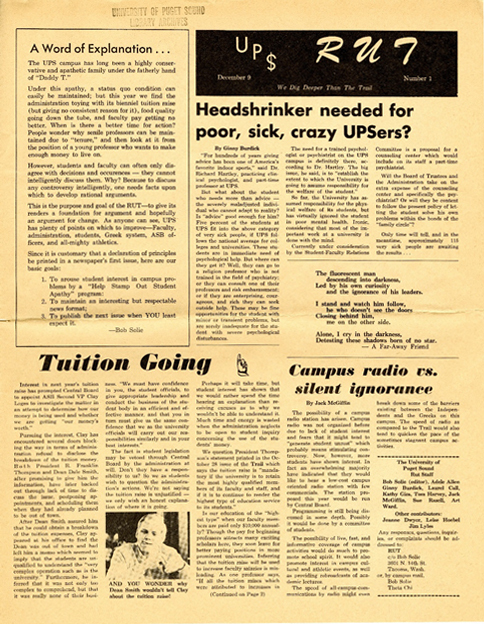 The other alternative student newspapers mostly followed similar themes, and included The Grassroots Forum, the UP$ Rut, the Index, The Advocate, and The Third Eye. To learn more, come visit the A&SC and take a look! 3:00 p.m. or by appointment.